Ask anyone who grew up in suburban Detroit in the past forty years and they will explain the odd relationship that has long existed between the suburbanites and the City of Detroit. As I was coming of age in the Detroit suburbs, I was well aware of Mayor Coleman Young's sentiment toward the mostly white suburbanites. According to his Wikipedia entry, Mayor Young "was criticized for his confrontational style toward suburban interests and the apparent diversion of city resources to downtown Detroit from other neighborhoods. Young was generally popular with the inhabitants of the inner city, while generally disliked by those of the suburbs because of his outspoken criticism of racism, white flight to the suburbs, economic problems, and other similar issues." Following the race riots of the late 1960s in Detroit, most Jews fled the city for the northwestern suburbs. My grandparents and parents were part of this migration. They moved from beautiful neighborhoods in Detroit to large homes in Bloomfield Hills and Southfield, Michigan. The City of Detroit became part of the history of Detroit's Jewish community. My parents talk of "Old Jewish Detroit" the way their grandparents talked of the "Old Country." Many Jewish Detroiters will venture Downtown to work, but make sure to head back North on the highway to be home by dinnertime. I've always gone Downtown for professional hockey, baseball or football games, as well as for concerts and theater productions, but we don't often make a day of it like you can in other large American cities. Some of this has changed in recent years. There has certainly been a bit of a renaissance taking place in Detroit. New stadiums for the Detroit Tigers (Comerica Park) and the Detroit Lions (Ford Field) have helped. Entrepreneurs like Dan Gilbert (Quicken Loans) and Peter Karmanos (Compuware) moving their companies Downtown has helped too. In the Jewish community, there has been a concerted effort to reinvigorate city life in Detroit. A recent New York Times article focused on the young entrepreneurial move to the City of Detroit. The opening of a Moishe House will further help to bring young Jews to the city and create an urban renaissance. There seems to be a lot of optimism about a turnaround for the City of Detroit. Perhaps all this good news is what makes the reports of disgraced former mayor Kwame Kilpatrick's upcoming book so disappointing. Mayor Coleman Young was a corrupt politician who likely benefited from kickbacks. But somehow, he survived as mayor for twenty years. Kwame Kilpatrick was worse. His hubris, deceit and unlawfulness caused his downfall. 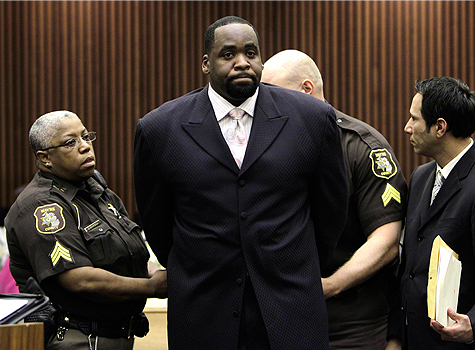 Kwame Kilpatrick is serving a five-year jail sentence right now. But that hasn't kept him from writing a book in which he blames his downfall on a Jewish conspiracy. The fact that there are no Jewish people around who could be blamed for his illegal activity notwithstanding, Kwame alleges that there was a Jewish plot to bring him down. The book is saturated with a redemptive overtone that tends to relay the renewed spiritual connection Kilpatrick has developed. It’s through this lens that he speaks to what happened to him, not declaring innocence in his actions but the unfairness in how the events surrounding those actions were handled. Rather than seeking repentance for his misdeeds, Kwame cries that it was unfair the way he was treated and looks for a scapegoat. So, why not the Jews? There’s always been somewhat of an underlying question in the midst of the Kilpatrick scandal: Who the hell did he piss off to bring this level of scrutiny? This question could be answered in Kilpatrick’s account of visits by Detroit attorney Reggie Turner on behalf of the area’s powerful Jewish community. Kilpatrick’s General Counsel Sharon McPhail angered many organizations when she set out to improve the placement rates for groups receiving Workforce Development funds. She required recipients to reapply for their funding and submit detailed strategies to improve placement rates. The Jewish Vocational Services, who received $25 million from the city in workforce funds, had only a two percent placement rate. They were cut. According to Kilpatrick, the February 2007 Savior’s Day, an important event for African Americans, at Ford Field with Nation of Islam national leader Louis Farrakhan was also an offense to the Jewish community. It's amazing that throughout history the Jewish people have been an easy scapegoat. Here in Detroit, Henry Ford blamed the Jews for the nation's ills. Father Charles Coughlin publicly scapegoated the Jews for all the political and economic problems in the world. It's shameful that the unremorseful former mayor is still looking for someone to blame. It's equally troubling that the Michigan Citizen seems to fall for Kwame's overt anti-Semitism. I wonder if they were compelled to give a positive review of Kwame's autobiography in exchange for being the first media agency to get its hands on a copy of the book. The list of charges in Kwame's indictment is a long one. But perhaps the most egregious crime is that Kwame continues to grow the unfortunate divide among Detroit's Jewish community in the suburbs and the City of Detroit at a time when a renaissance is within reach. And that's just sad. I was davening in Sharey Tzedeck in Southfield when I learned that Rabbi Groner's son - would be come a Wayne County Circuit Court judge (this was 2002 or 2003). Maybe Kwame has something against Judge Groner's yiddishkeit. Jason, I'm glad you're covering this story. I knew Kwame was a bigot, as well as a thief and a liar, but the projection of his own problems onto the Jews is well-trodden territory. Since no one else has seen the book, we have to rely on the Michigan Citizen's account, for now. I hope this book is the final nail in the coffin for Kwame, and his supporters see him for who and what he truly is. Rabbi Groner's son, the Honorable David Groner, did his job -- nothing more and nothing less. There's not a fair-minded judge in Michigan who could have dealt differently with Kwame than Judge Groner. If anything he was too lenient the first time. There's no Jewish conspiracy against Kwame. There's a self destructive persona that brought him down. I have a friend who was in Kwame's law school class. When Kwame first became mayor, my friend told me about his antics in law school. His hubris caused his downfall. Its amazing that these bigots are still here today but not surprising. Was Kwame a public figure in Detroit? What exactly?